Amazon Declares War on the Hyphen, Could the Semicolon be Next? Amazon strives to always be responsive to customer requests, but they also like to reduce costs by making their staff stick to scripts whenever possible, and sometimes this can result in absurd situations. Moonstruck has been out for around 18 months now. It’s done well for itself and, at the time of writing has around 123 reviews on Amazon.com, the overwhelming majority of which are four and five stars. Even the few people that have not liked the book have not had a go at the editing – and for good reason – I spent well over £1000 on getting that book edited, using the best editors I could find. I was more than happy with the product, so was bemused by this email. When I clicked on it to take a look inside my confusion grew. Thanks for contacting us and giving me the opportunity to help you. I will be more than glad to assist you with your inquiry. As quality issues with your book negatively affect the reading experience, we have removed your title from sale until these issues are corrected. Books with serious errors that are not corrected after 60 days will have their product detail pages removed from the website. Your book will still appear in your Bookshelf, and you can update it and resubmit it at any time. Once you correct hyphenated words, please republish your book and make it available for sale. 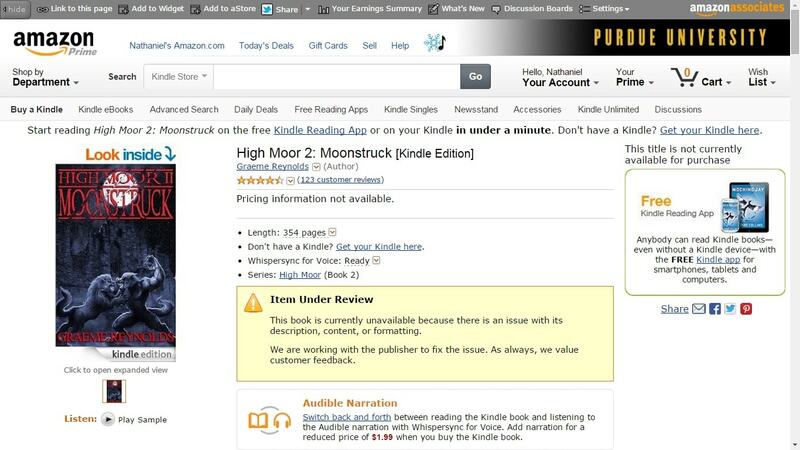 I can confirm that the book in question, High Moor 2: Moonstruck, is indeed missing from the Kindle Store. As you can see, the listing shows the standard nonspecific message explaining that the ebook has been pulled. This isn't the first time that Amazon has pulled a book on the complaint of a customer, but it is the most unusual. All of the previous incidents I had heard about involved formatting complaints, and not editorial decisions. But clearly Amazon has moved on from setting minimum formatting standards to setting new rules for editorial quality, and who knows where it will end. Now that hyphenated words are banned, the next obvious step could be to issue a proclamation on the correct use of the word "literally", and after that Amazon might ban the use of British misspelling. But Amazon had better not forbid the use of the dangling participle; that is a decision up with which I will not put (to quote Churchill). In case you had any doubt, yes, I am treating this incident with humor. While this is a nuisance for Graeme it is so utterly ridiculous that it deserves either scorn or satire. And since I would be willing to bet that Amazon will overrule the bot that pulled this ebook, I chose humor. Update: The comment section of Graeme's post has revealed that there may actually have been a real formatting issue. He was using minus signs in place of a dash, and that could cause problems when the text is read aloud. Rather than saying the words half-and-half, a TTS engine might say half minus and minus half. Probably humor is the right tone. One hopes Amazon isn’t serious about this mywayorthehighway* approach. *I was going to hyphenate mywayorthehighway, but I defer to our Webbot overlords. Long may they reign! While I appreciate the humour, I’d like to get a bit serious. Amazon is prob-ably taking the com-plaint to be a standard scan-ning error type of com-plaint, where the con-tents were scan-ned and not proof-read, so that the end-of-line word split-ting hypens haven’t been remov-ed. If you can get a book removed from Amazon for this reason, there are probably thousands of scanned older books from the major publishers that can get pulled for scan errors. That would make sense. I was just cracking a joke because it’s funny, but I think you identified which script was being read. Some of the comments on the original post suggest he might accidentally have used the wrong unicode character for the hyphen so it was getting read oddly by text-to-speech transcription for the visually impaired. I just don’t trust them. Do you? They are so sneaky looking and slanted and and they’ve got their cursive little pinky artfully extended. Let’s all dash out and ban italics, shall we? I thought the semi-colon was already dead in America, shortly after the parenthesis was hounded out of existence. Indeed, the hyphen murdered the parenthesis and took its place. This the key point. They were identifiable via a *spell checker. * A spell check should not have flagged words that are normally hyphenated (it may have been confused by some that optionally spelled with or without the hyphen, but over a hundred?). It also would not have flagged words that the kindle reader software just happened to break at the line end at a particular font size. I’m very suspicious that it would even have flagged them for being normally hyphenated but using the wrong character (minus sign instead of hyphen). Since reading aloud isn’t mentioned in the original message, I’m even less inclined to think that was the main issue. Most likely it would have flagged them because they were actually wrong, ie there was a hyphen hardcoded into the middle of the word. This is maddeningly common in ebooks (I’d guess it’s an issue with soft-coded hyphens from the source material getting screwed up in the conversion process), and it absolutely does negatively impact the reading experience. A lot. No, a TTS engine is expected to say “minus” when it finds the “minus” character (using entity or not) in text, as well as “plus” when it finds “+”, “times” when it finds “×” and “divided by” when it finds “÷”. What a dumb TTS engine would do is saying “minus” when it finds the “hyphen-minus” character. You can’t say that a TTS engine is dumb because it does what it is supposed to do, i.e. taking the “minus” character into account when it finds “−” in markup. It is not supposed to tell it is used as an hyphen because nobody would use “minus” instead of an hyphen in the first place. Text to speech is incredibly hard and engines are compensating for a lot of things already. And in various languages. If you don’t know how difficult it is to make it work, please stop being a jerk. Thanks. Except that as far as a writer is concerned, it is the same key on the keyboard. So yes, I could see that a minus can show up in place of a hyphen or vice versa. And the reason I said that a dumb TTS engine would make this mistake is that a smart one would be context aware and know that a minus between two words should be treated as a dash, just like it should know that “…” should be treated as an ellipsis and not said as “dot dot dot”. I’ve heard that later mistake before. Nate, as far as I understand, the “key” on the keyboard is usually mapped to a “hyphen-minus” character, which is different from “minus” AND diferent from “hyphen”. If I understand bangbango “hyphen-minus” is usually “smartly” managed by TTS software, but is is uderstood that “minus” is really intended as a minus, and not as an hyphen. The author seems to have explicitely replaced the “hyphen-minus” by “minus” rather than “hyphen”, which can cause bad side effects WRT TTS software. Ah. Thanks for correcting me.